From a distance Wales and India may seem like incongruous partners: the modest size and verdant landscape of one set against a subcontinent of complexities. But perhaps incongruous partners are the most interesting. Textile production and craft remain stubbornly alive in pockets of both locals – preserving but more crucially using particular materials and knowledge of making. Eleri Mills’ and Julia Griffiths Jones’ depictions of Welsh culture and landscape often draw on intimate familiarity. Mills’ travels allowed time to study landscape paintings from the Mughal Empire. Vibrant Indian silk in saturated colours now appear on stitched and painted calico and textured khadi paper. Jones’ attention to the personality of the drawn line moves onto brightly printed cloth. It is also captured in wire that integrates references to the Indian landscape and local culture such as Gujarat dowry bags. 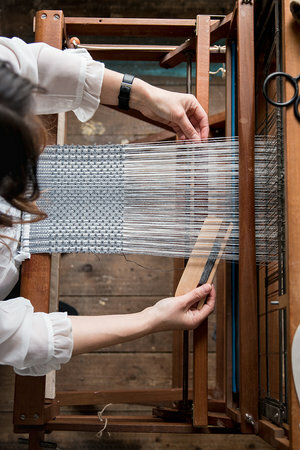 Laura Thomas and Louise Tucker incorporate new materials from their travels. Thomas’ technically innovative handwoven structures use hand-spun and dyed kala cotton from Kachchh. Like Thomas, Tucker also weaves – but rather than thread she uses oak and maple strips dip-dyed with metal and woven into lighting. Her focus is on the play of light and shadow: piercing brightness in India, cloudy softness in Wales. The novelist Henry Miller wrote, “One’s destination is never a place, but always a new way of seeing things.” The four Welsh artists who travelled to India as part of the Threads exchange project visited concrete places. But the strongest impact of these journeys is their ways of seeing both the familiar and new. “Seeing Things” catalogue text commissioned by Fieldwork for the Threads: India/Wales textile exchange project. Exhibition opening Ruthin Craft Centre: the Centre for Applied Arts, Wales November 2018.
image above & home page Speckle Weave courtesy of Louise Tucker & Fieldwork.